As posted by VMware’s Rick Blythe, the vCenter Support Assistant 5.5 has been released to the Interwebs and is available for download. Imagine that! So, of course, I just had to snag a copy and take it for a spin. For those new to the tool, it is a small OVA that deploys into your environment to send alerts, recommends fixes, can transmit support bundles, and auto collects log data based on a defined schedule. 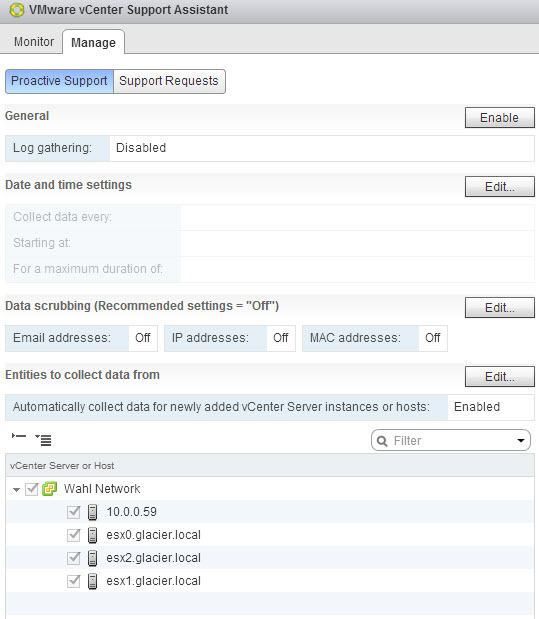 You can also use it to file support requests (SRs) directly from the plugin by logging into MyVMware. I’ll walk through the installation and configuration steps using the Wahl Network lab for your viewing pleasure. Keep all hands and feet inside the unicorn at all times. I’m going to assume that you have a healthy vSphere environment, have downloaded the OVA file, and have imported it into your infrastructure. The appliances uses 2 vCPUs and 2 GB of memory out of the box, along with just over 1.3 GB of disk space (provisioned for 250 GB). VMware recommends 65 GB of space at a minimum, plus another 300 MB per vCenter and 50 MB for each ESXi host. 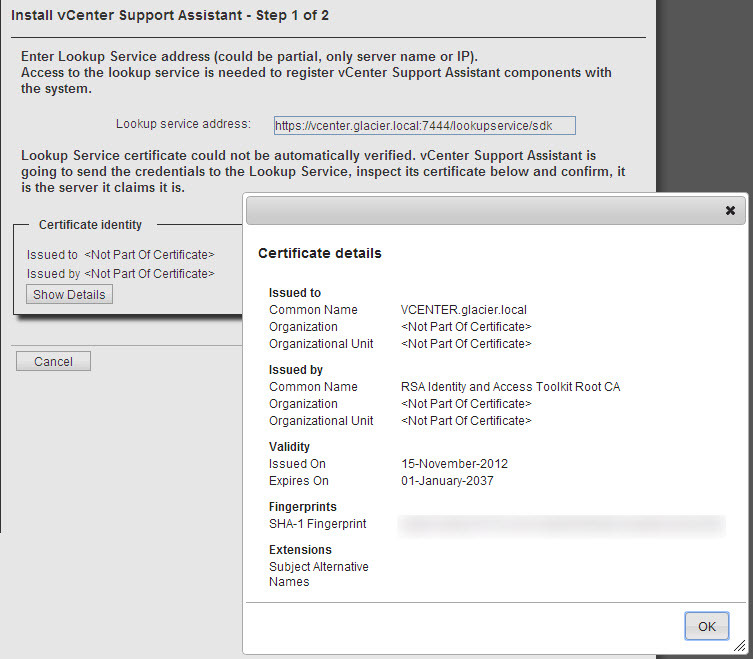 Once your server has been contacted, the URL will expand to https://vcenter:7444/lookupservice/sdk automagically and you may see a certificate identity warning. I’m in a lab and don’t care to toy with 3rd party certs (excuse: lazy), but you should ensure the fingerprint matches your production environment and the certificates are valid. That wraps up the major configuration portion. 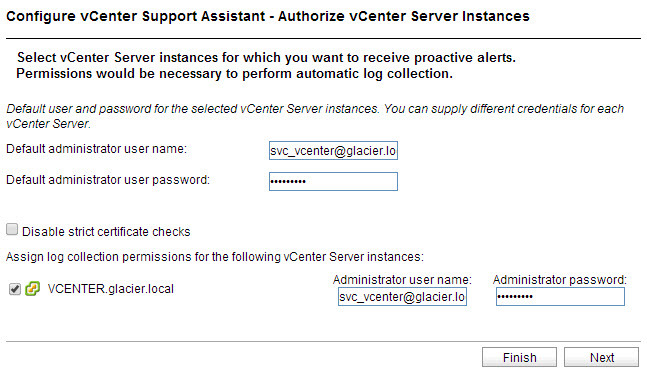 It’s now time to add your vCenter Server instances. 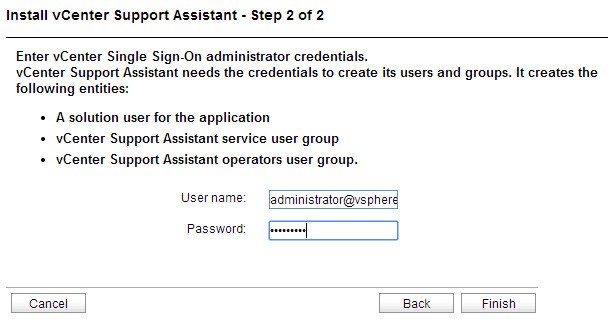 Click the link to hop on into your vSphere Web Client and continue the configuration. Not much going on here … yet! You can also tweak your entity selection or let it use the default value and just collect everything. My lab is simple enough that I left it in a state where it will collect everything. I also left the data scrubbing feature off, since I don’t care if they can see my email addresses, IP addresses, or MAC addresses. No tinfoil hat for this guy! One thing I noticed between the 5.1 appliance and 5.5 appliance is that it can only monitor 1 vCenter instance per appliance. 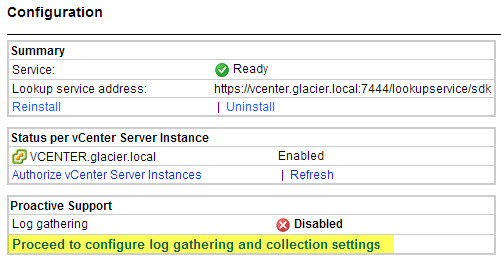 The previous versions had the ability to monitor multiple vCenter instances.